Cam was itching to get here to have a pint of Dark Drake. ...but it wasn't on! Big disappointment. The pub was heaving but we found a seat and Cam had a whole pork pie to cheer himself up. 13:30 Lunch stop. Busy, sat in the snug. Shame the screens have been cut down. The Landlady knows her beer. Early evening visit. I was very taken by this excellent pub. I’d like to come back again when it is less crowded and enjoy it a little more. Spire - Sergeant Pepper Stout 5.50 Complex black stout with a spicy black pepper taste. Dancing Duck - Dark Drake 4.50 Dark and smooth, with oatmeal, liquorice and coffee tastes. Lunchtime trade was brisk on a Friday. Lincoln Green - Hood Best Bitter 4.20 Malty amber bitter with a little hop in the finish. My score 14/20. Beer festival here with casks stillaged in the outbuildings of the pub. Blue Monkey - Rhesus To Be Cheerful 4.50 Well hopped amber bitter with some chewy malt as well. Bittersweet finish. My score 15/20. Busy on a Friday lunchtime. Silver Brewhouse (formerly Raw) - Majic Mild 3.20 Black mild with a fairly bitter roast malt character, albeit with a rather thin body. My score 15/20. First visit here since it became a Dancing Duck pub. Bank Holiday beer festival in progress with beers stillaged in an outbuilding in the garden. Monty's - Desert Rats 3.80 Dry as a desert - very pale and rather bitter with a bitter hop character. Very dry finish. My score 14/20. Ossett - Lion Brew 3.90 Pale, dry and hoppy with a rather sharp bitter hop flavour. Dry finish. My score 14/20. The bus from Ripley back to Derby conveniently stops on the bridge over the Derwent, very close to this lovely old multi-roomed Marstons house. Recommended. Marston's - Long Hop 4.00 On top form today. Just a handful of locals in on a Monday lunchtime. Very relaxed feel and had an excellent value toastie here. Jennings - Dark Mild 3.10 Dark brown mild with some chocolate malt and low hop rate. Rather thin finish. My score 15/20. 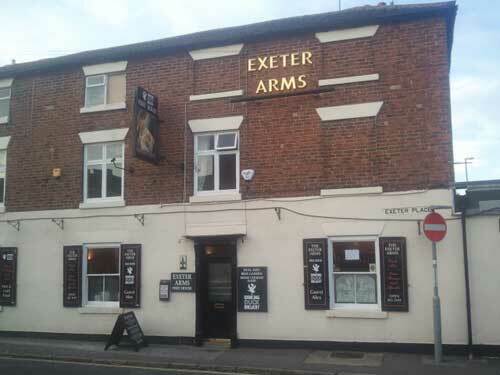 The pub is found in Derby, Derbyshire, DE1 2EU. Traditional multi roomed pub retaining its character. Good value food. Dancing Duck Brewery has a major involvement here and its beers major on the handpumps. We have visited this pub 9 times, seen 23 different beers and tried 11 of them.